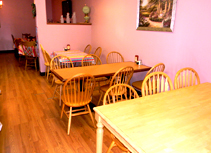 Cherry House Café offers a delightful venue for your next party or event. With seating for up to 40 guests, our party room is perfect for business meetings, celebrations, birthday parties, anniversaries, holiday gatherings, theme parties and more! Parties of 25 or more guests may request our entire banquet room and hold a “private” event, while smaller groups may reserve tables for their gathering. Our party room features a cozy fireplace and flat screen TV for your guests’ enjoyment. Guests may order directly from our regular menu selections, or ask us about catering options for your event. In order to best prepare for your event, we request a 2 week notice for reservations. Plan your next event with us today!